WWE's road to WrestleMania is set to come to a close, and before they kicked off the final week before the festivities, the company took a detour to a live event in Pikeville, Kentucky, where a co-branded events saw the superstars of RAW and SmackDown go at it. There were plenty of title matches and a lot of unexpected shockers. Here's what went down at the latest WWE live event! So we know that Elias' performances always end in interruption. It's standard. It's tradition at this point. We're often more shocked when Elias is actually able to complete a performance. 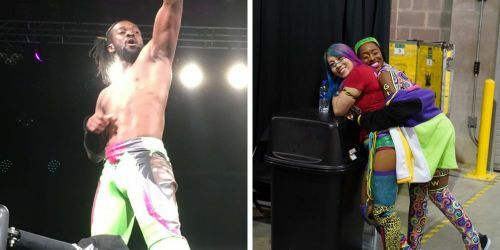 However, this time around, he was interrupted by Kofi Kingston and Big E of The New Day, both of whom chased him out. It would be the set up for a match between Kingston and Elias later on. The Cruiserweight Championship match at this year's WrestleMania happens to be none other than defending champion Buddy Murphy vs The Premier Athlete Tony Nese. It turns out that they didn't want to wait till WrestleMania, and they went at it for the WWE Cruiserweight Championship. Unfortunately for Nese, it would be an unsuccessful effort, and he'll be hoping that it isn't a preview of what is to come at WrestleMania 35. The Usos may not have a SmackDown Tag Team Championship match at WrestleMania 35, but that didn't stop them from being the fighting champions that they always are. They had a big task in hand by facing two other top tag teams from SmackDown Live. The Usos, being The Usos, managed to retain the titles in exciting fashion.